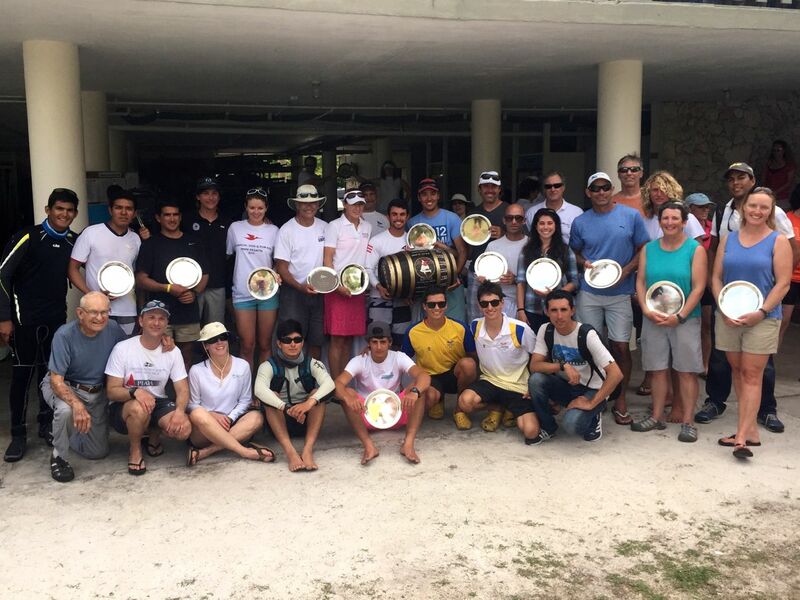 The Miami Snipe Fleet was well represented at the Nationals in 2015 and the results were excellent. Raul Rios and Kara Voss came in first place. 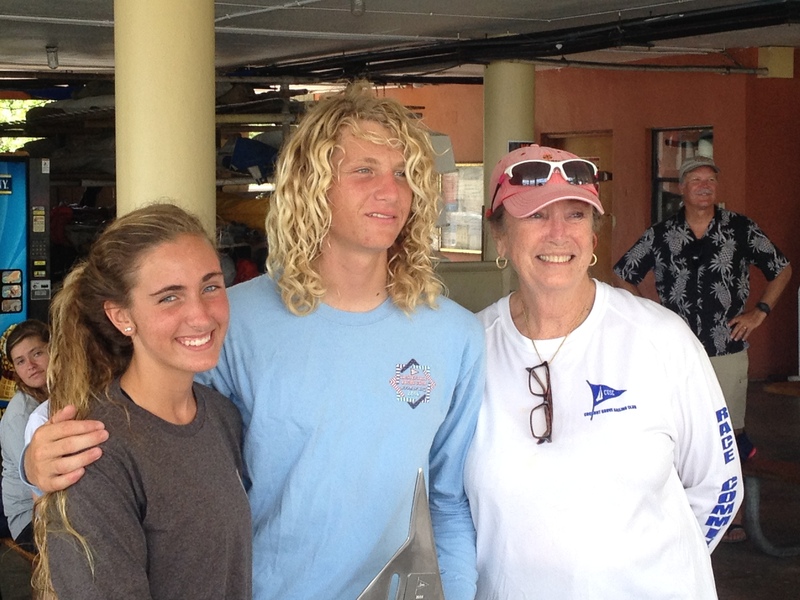 Second place was Jensen Mc Tighe from Ft. Lauderdale and crew Nikki Bruno. Third place went to Augie Diaz and Kathleen Tocke. Ninth place went to Enrique Quintero and Vera Mariani. 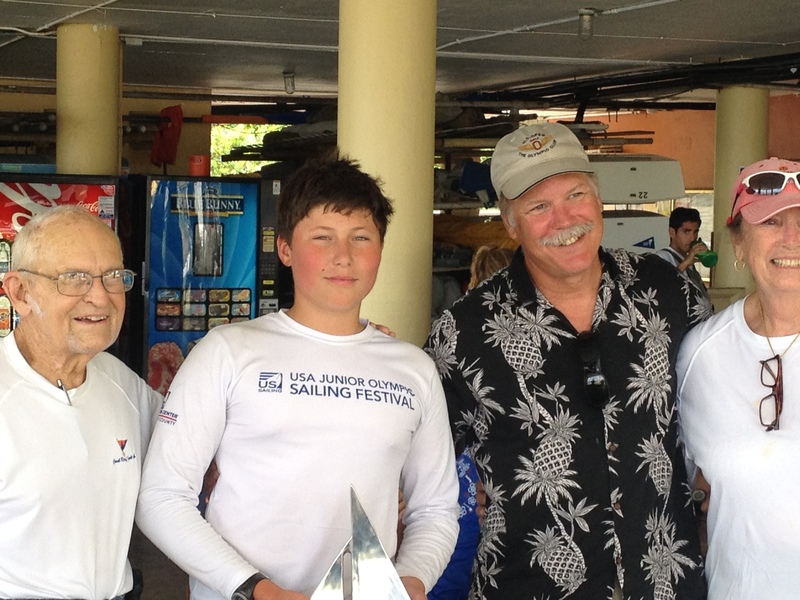 24th place went to Andre Guaragna from Miami and crew Johnny Fewell from Jacksonville. Gonzalo (Old Man) Diaz and Patti Bess came in 36th place. To read the entire story and see the photos click HERE. Some people really want to get to the Nationals! 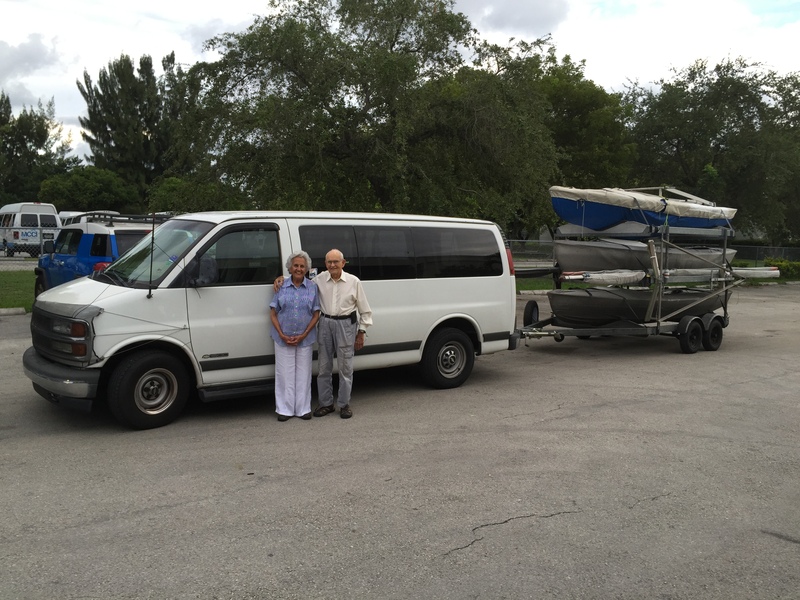 Gonzalo (old man) Diaz and his saintly wife Carmita hitched up three snipes to his 14 year old van to make the trip from Miami to San Diego for the nationals. Other than a flat tire “it cost me $27.00 to fix!” the trip was uneventful. All this at the nice young age of 80 something. 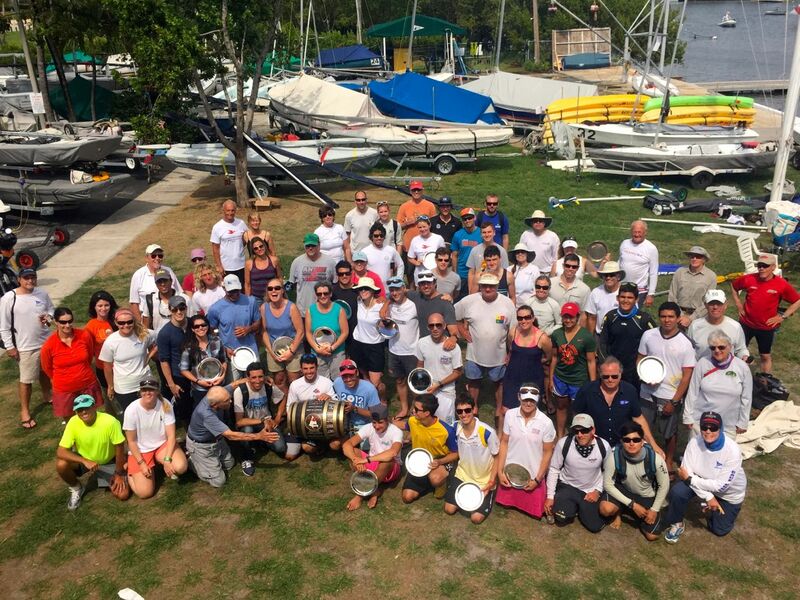 Snipe sailors representing eleven countries converged upon Biscayne Bay for the 2015 Don Q Rum regatta, hosted by Coconut Grove Sailing Club. 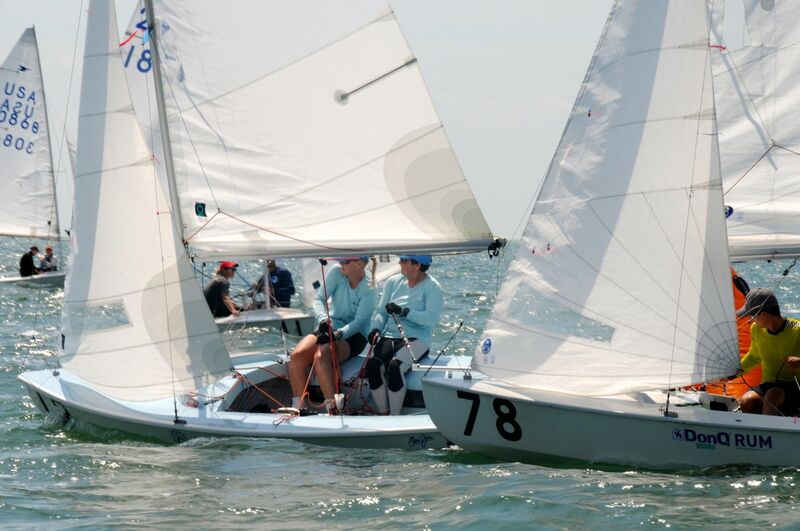 Thirty-eight teams comprised of champions, veterans, and novices completed five races over three days of classic Miami sunshine, warm water, and cool breezes. On Friday the sea breeze didn’t start to fill in until noon, so there was plenty of time for more bagels and coffee. Winds varied between 7-10 knots, mostly from the southeast. Finishing first in the first race was Luis Soubie and Diego Lipszyc of Argentina, followed by Raul Rios of Puerto Rico and local Andre Guaragna, and third saw locals Augie Diaz and Kathleen Tocke. Raul and Andre took over first place the next race, with Augie and Kathleen still right behind. 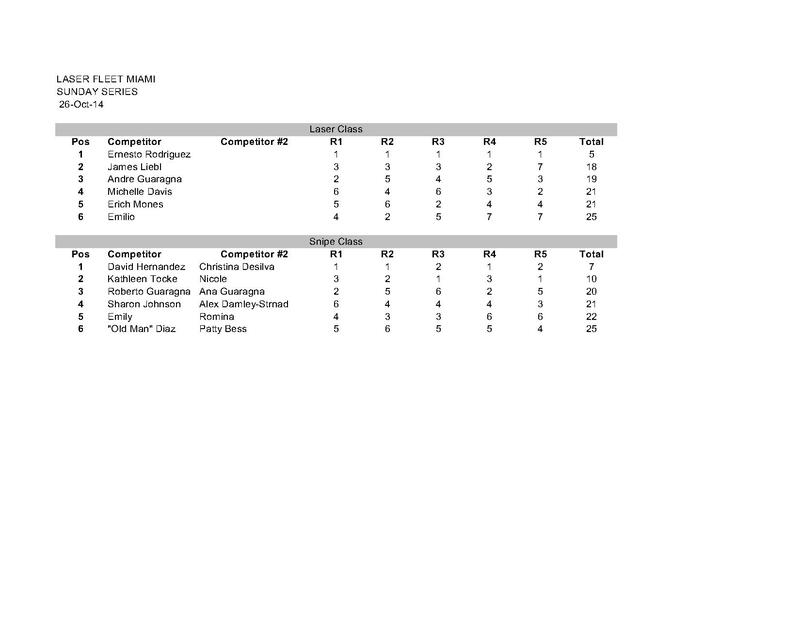 Louis and Diego slipped back to eighth while locals Peter Commette and Jensen McTighe picked up the third. Saturday began much the same way, and the sea breeze picked up to 7 knots around 1pm, quickly building up to a steady 11 for the rest of the afternoon while it clocked right from the southeast. 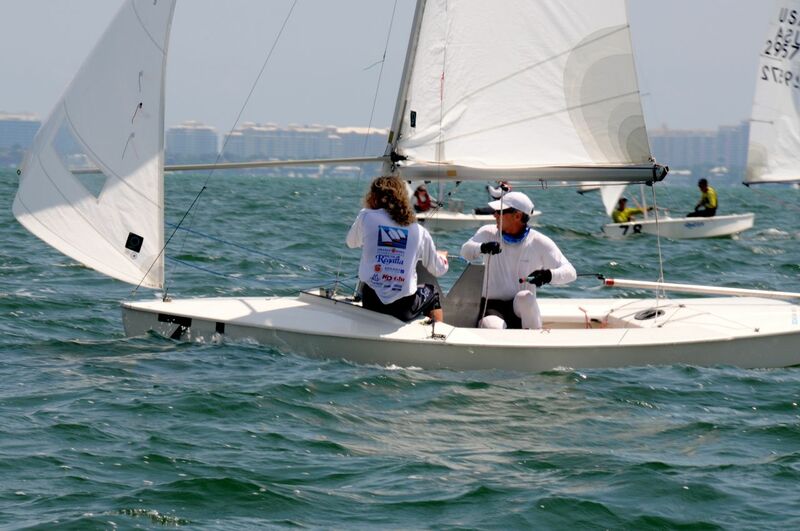 Locals Nick Voss and Nicole Popp finished first in race three, while Augie and Kathleen mixed it up, finishing in second just ahead of Raul and Andre who took third. Determined to keep their lead, the fourth race was led much of the way by Raul and Andre who put a sizable gap between their boat and second place, locals Ernesto Rodriguez and Eduardo Mintzias, who were followed closely by Augie and Kathleen in third. 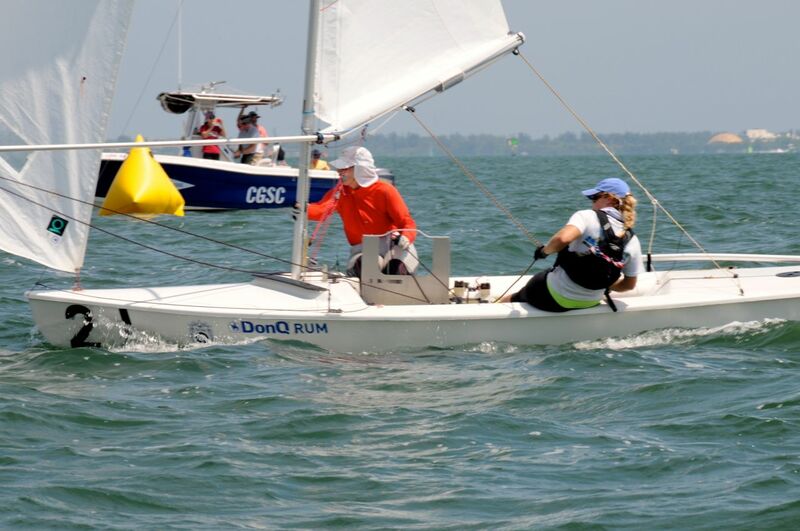 After racing the second day, sailors were greeted at the dock with Don Q daiquiris that, after a brief supply shortage scare, continued to flow freely throughout the delicious Cuban dinner buffet at the club. The breeze kicked in Sunday morning around 10:30, which worked out perfectly with the usual earlier start time. 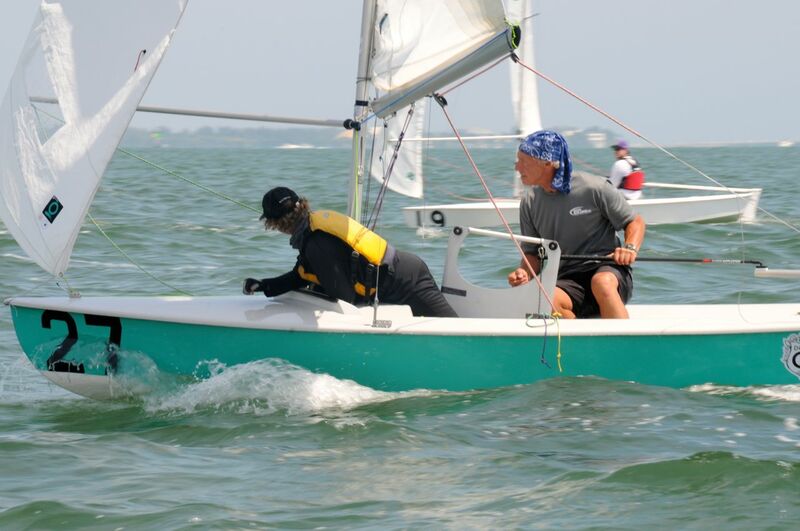 One race was completed in a steady 9 knot breeze that shifted left from the southwest. Raul and Augie, who had been duking it out the first four races, slipped back to ninth and tenth respectively this race, while Louis and Diego reclaimed the first spot. Closely behind were north-easterners Andrew Pimental and Nikki Bruno. Nick and Nicole came back as well for a final finish in third. Awards were given to the top ten placing teams, representing Puerto Rico, USA, Argentina, Brazil and Ecuador. Raul and Andre took the overall win and perpetual trophy with a total of 16 points. Augie and Kathleen won second overall with 20 points and in third were Louis and Diego with 30 points. The Snipe class would like to thank our hosts, Coconut Grove Sailing Club, the race committee who kept us in line, and all those who helped feed us and run the show. 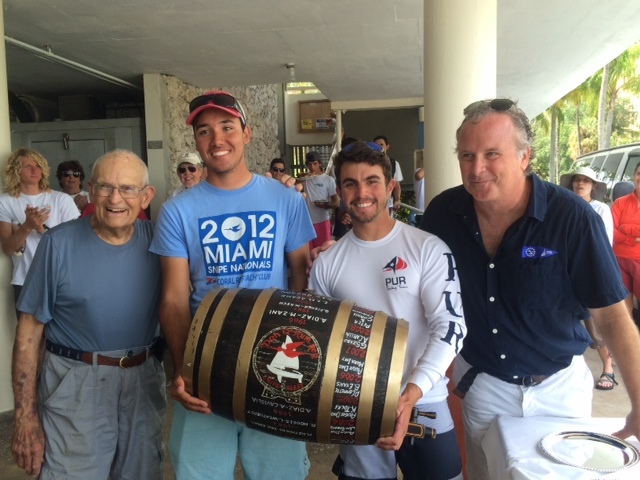 Thanks to Cathy & Marc Buller for providing their Otra Cuba Libre as Signal Boat. Signal Boat crew included PRO Ron Rostorfer (PC), Snipe Class Representative Brainard Cooper, Timer Dottie Rostorfer, Flag and Sound Signalers Veronic Aghayan, Steve Schwartz and Paco Calvet, and recorders Connie Bradley, Suzanne Roberts and Saralee Lamb. The weather mark team was Race Officer and RC Chair Susan Walcutt, Skipper Gary Ellis, with crew Ryan Alexander and Philippe Dusser. Handling the Gate were Race Officer George Bradley, Skippers Julie Hanrahan and Ev Hoffman, with Andi Hoffman and Jim Waldron crewing. The Pin Boat Race Officer was Race Manager Blake Middleton, with Skippers Dennis Jansma and Rick Klein, and crews Freddie Sambolin and Deb Jansma. Special thanks to Protest Committee Jere Woltz, Joan Lawrence and Jaime Ramon. 1959 Charles Morris,1960 Bruce Cochran, 1961 Dan Brown, 1964 Fred Bremen, Jr., 1965 Tom Bremen, 1967 David Albury, 1968 Augie Diaz. to mention some. 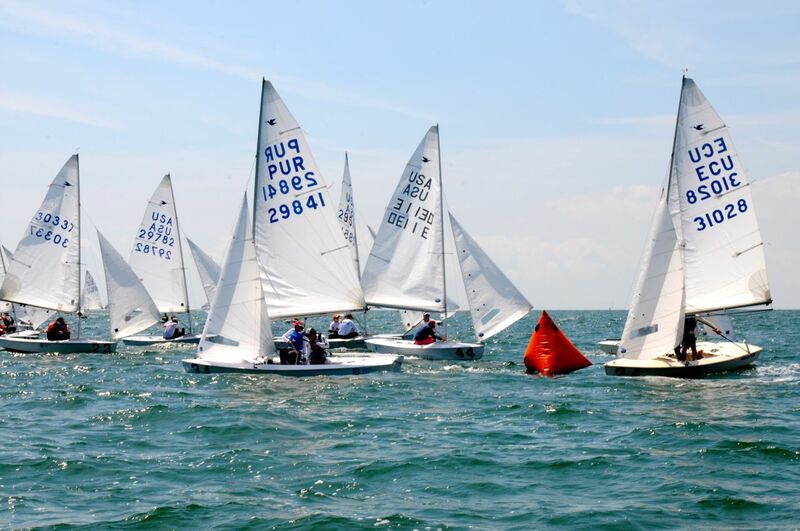 This Championship was moved around Florida, but right after 1968 the Miami Yacht Club took over holding this regatta and a year later Coconut Grove Sailing Club took over and from then on to today our Club together with the Miami Snipe Fleet have been sponsoring the Florida State Snipe Junior Championship. Jensen McTighe with crew Dae Kelly won the Championship this year. 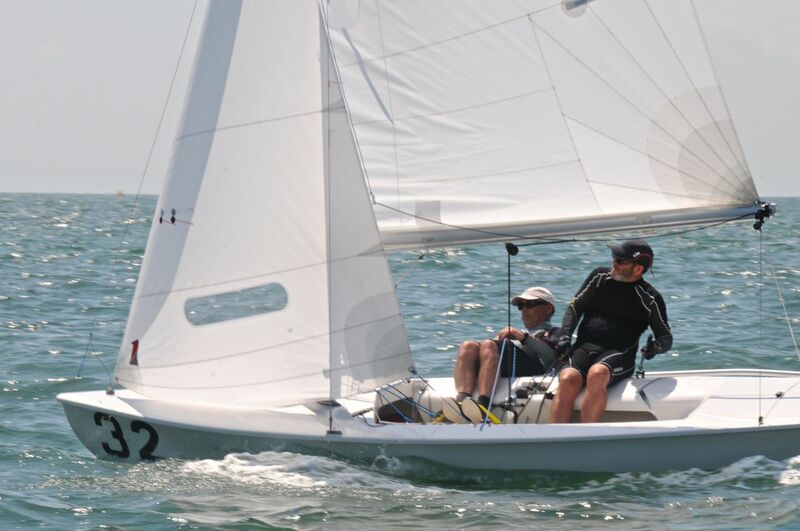 Jensen and Dae sailed the first 4 races on Saturday without a pole (broke the pole before the first race) I wished we had filmed some of the downwind finishes with Jensen without a pole trying to hold second place from passing him and he was very successful!! (see the results). On Saturday the RC set windward leeward courses with winds 10 mph clocking from approximately 125 degrees and on. Similar conditions on Sunday but with a little more wind. The Race Committee was able to complete the scheduled 6 races with one throw out. The Coconut Grove Sailing Club Race Committee did a wonderful job with Susan Walcutt as the PRO and first class help from Jaime Ramon, Andi Hoffman, Veronic Aghayan, Denise Schneider, Carol Temple, Jim Waldron, Sandrine Quenne, Paul Sarvich, Jose Torres, Larry Whipple, Bill Godfrey and special thanks to Clint and Terry Boram that commanded and donated the use of their boat “Sea Jewel” as the Signal Boat for this Regatta. Also special thanks to Pere Puig for helping in preparing and fixing some of the Junior boats. After the races, the juniors and the Race Committee enjoyed a hamburger cookout followed by Susan Walcutt presenting the trophies to the first 3 winners.